In the event you end up with two or more duplicate people, companies or locations in your account Address Book, they can be merged using our contact merge option. Simply select two contacts that you would like to merge and use the Merge action button that activates at the top of the list. If there are conflicts between the two Address Book entries, you'll be prompted to select which information you would like to keep. Additionally, you can go to a single contact while browsing your Address Book or pulling them up in the search box in the left sidebar and, if there are possible matches, they'll appear in the Possible Duplicate Contacts box on the overview tab where you can either ignore the duplicate or merge it from there. Note: You can merge 2 contacts at a time as long as they are the same "kind" of contact (person, company, location), using our contact merge option when checking them off in the Address Book. 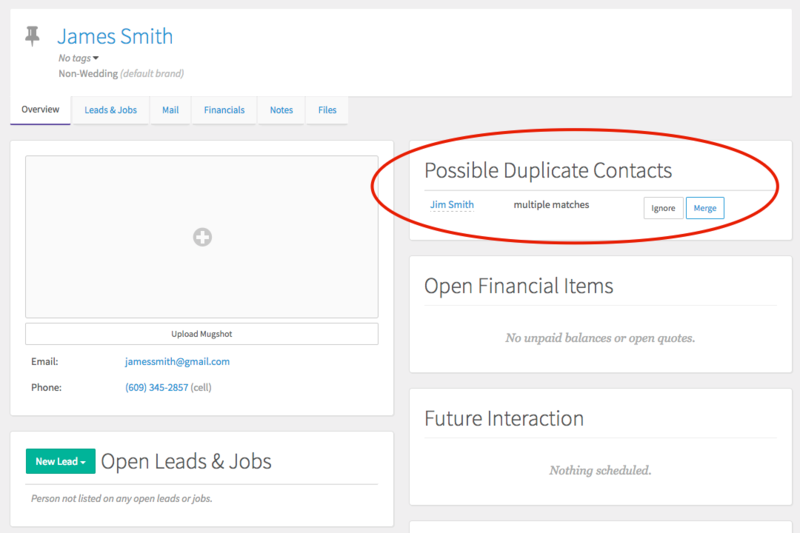 If you have more then 2 duplicate contacts, you will be required to merge them 2 at a time.